Barely two weeks ago we were shocked with the tragedy involving foreign workers while on their routine to demolish the old Jaya Supermarket building. Last week we were again shocked (or, should we be shocked anymore?) 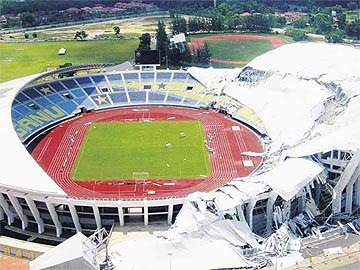 by the collapse of roof of Sultan Mizan Zainal Abidin Stadium. "Flaking" new Federal Administration building in Jln Sulaman, K.Kinabalu. Cracked and unsafe JPJ HQ building at Jln Bundusan? Photo from Berita Harian showing the collapsed roof. Did we have a slightest tremor that could have shaked the "tough-build" stadium recently? 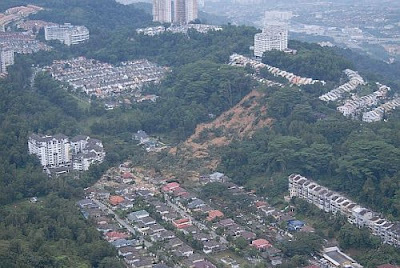 Photo from TheStar showing the section of Bukit Antarabangsa which failed and slid. 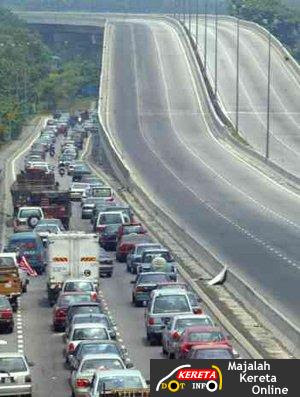 Photo by keretadotcom magazine shows motorist being deprived of better traffic flow due to mistake not of their doing. Speaking of flake, if you frequent the big shopping mall,1Borneo Hypermart, you'll notice that the tiles are also flaking like the scales of a dead crocodile. They have to cover these sections with non-slip garment or even masking tapes to hide the scaled floor. What I'm saying is that, these big structures were build at staggering cost and we choose to go slow and easy in solving them from the root cause. We tend to fire-fight everytime there are problems but we selectively ignore the real problems underlaying. The Sultan Mizan Zainal Abidin Stadium was built for RM292mil, MRR2 at RM120mil (could someone tell me how much did it cost us to build teh new Putrajaya Building at Jalan Sulaman, KK?). If the people seem not to be surprised anymore, it would not be because we are facing man made problems but rather at the pace the entrusted Leaders are handling things. I'm not surprised at why the roof of the stadium collapsed but I'd be really surprised if there is no party/ies held responsible for it after the thorough investigation. For your own good, don't include "Act of God" as one of the reason in your report because God is not party to your man-made destruction. It is "Your Acts and My Acts" that ruin things! hi sunsuron, thanks for visiting. your giuk.net seem to work fine now, i tought i had problem registering.